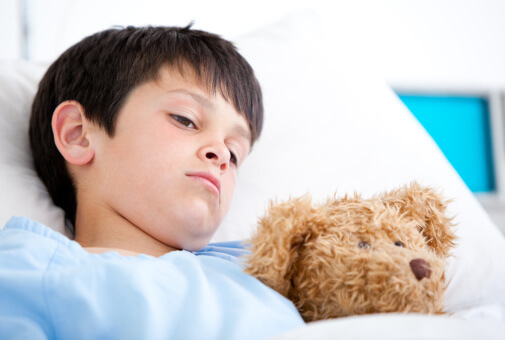 Group A strep is a common cause of illness in children. Usually the disease is as mild as strep throat, but strep can also cause serious illnesses, including toxic shock, “flesh-eating disease,” and rheumatic fever, a serious form of heart disease. Preventing rheumatic fever and other complications is one of the major reasons we treat all cases of strep with antibiotics. During the 1960s and 1970s, rheumatic fever was a major worldwide problem. When it seemed to disappear, people thought it had become a disease of the past. After its resurgence, we learned that rheumatic fever comes and goes in waves. It can cause serious illness wherever strep throat occurs. Rheumatic fever is a serious inflammatory disease that can follow untreated or inadequately treated streptococcal infections. The major ongoing problem from rheumatic fever is the possible long-term destruction of heart valves. Why is strep sometimes mild and sometimes so severe? It is thought that some children may be genetically more likely than other children to develop rheumatic fever when infected with strep. Other studies show that certain strains of strep may carry a greater risk of causing rheumatic fever. A study published in the March 26, 2002 edition of the Proceedings of the National Academy of Sciences supports the idea that certain strains are more dangerous than others. Scientists from the National Institute of Allergy and Infectious Diseases (NIAID) analyzed strep bacteria from 36 different rheumatic fever outbreaks. They have discovered several genes present in those strains of strep that are not present in other strains. The genes are the blueprints for specific toxins. It appears that different subtypes of Group A strep are responsible for different degrees and locations of illness. And an interesting twist – the extra genes appear to be ‘swappable,’ injected into the strep by a tiny virus that infects the strep bacteria! Rheumatic fever is most common in children between the ages of 5 and 15. It follows strep throat and other strep infections caused by specific streptococcal strains. Rheumatic fever often occurs in outbreaks. Children with rheumatic fever may have red, painful, swollen joints; uncontrolled limb movements; a characteristic rash; non-tender nodules under the skin; heart problems; and/or a high fever. Rheumatic fever is not directly contagious, but the strep infection that triggered the rheumatic fever is contagious. Rheumatic fever can continue to cause new problems for as many as 40 or 50 years after the initial illness. The diagnosis is based on specific symptoms called the Jones Criteria. To be diagnosed with rheumatic fever, someone must exhibit evidence of a recent strep infection along with 2 of the major criteria, or 1 of the major criteria and 2 of the minor criteria. Treatment for rheumatic fever usually includes anti-infective agents and anti-inflammatory agents. Often cardiac medications are needed. Sometimes neurologic medicines are needed to treat the chorea. Rheumatic fever may be prevented by preventing strep infections, or by identifying strep infections and treating them quickly with appropriate antibiotics. Preventing rheumatic fever is a major reason for strep to be treated promptly even at a time when antibiotics are often overused.